WordStream’s Free Keyword Tool provides you with a range of valuable information, such as search volume for each individual keyword in Google and its general competitiveness. Read more about commercial intent keywords in this blog post. Another crucial aspect of keywords that is essential for the success of a search engine marketing campaign is account structure. Logical keyword grouping and account structure can help you achieve higher click-through rates, lower costs-per-click, and generally stronger overall performance, and keyword research can help you think about how to best structure your account. Maximum bid is the maximum amount you have specified you are willing to pay for a click. Quality Score is a metric based on the overall quality of your advertisement. Google calculates these metrics during the ad auction to determine placement of advertisements. The result of this calculation is known as ad rank. Given that Google AdWords’ Quality Score comprises half of the ad rank formula, it is one of the most crucial metrics search engine marketers can focus on. High Quality Scores can help you achieve better ad position at lower costs, because Google favors ads that are highly relevant to user queries. Quality Score is arguably the most important metric in search engine marketing. To learn more about Quality Score and the impact it can have on your campaigns, read this resource at PPC University. Our integrated PPC management platform, WordStream Advisor, makes managing your search engine marketing campaigns easy and efficient, leaving you more time to focus on what really matters – growing your business. WordStream Advisor’s 20-Minute Work Week has revolutionized paid search management for thousands of businesses. Our intelligent, customizable alerts highlight areas of your AdWords and Bing Ads accounts that are performing strongly, and identifies areas in which improvements can be made for immediate results. WordStream Advisor is the only PPC management platform on the market that is fully integrated with Google AdWords and Bing Ads, making it easier than ever to manage your search engine marketing campaigns from one intuitive, centralized dashboard. 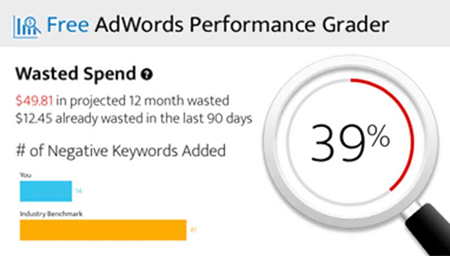 The WordStream AdWords Performance Grader is absolutely free, so get your grade today and start making immediate improvements to your search engine marketing campaigns.